Today marks a new chapter in my cake journey. A major re-brand! I have ummed and ahhed about it for twelve months and the time has come. Friends and customers have asked me, “But why? You’ve got a good thing going on. Why change now?” and say things like, “But you’re keeping your logo right? I love your logo!” The basic answer is that ‘Cupcakes By Tara’ just doesn’t fit anymore. And, no, I won’t be keeping the logo. It’s time for a fresh start. New name. New logo. Cupcakes By Tara started about three and a half years ago. I was pregnant with my first baby and wondered whether I should consider turning my cupcake obsession (I truly was obsessed) into a business that would allow me to stay at home with my baby instead of going back to work. The thought of having flexible hours was so appealing to me and I could do what I truly love! But I really wasn’t sure about how to go about it. It was coming up to Valentines Day in 2011, and as per usual, I was obsessing about cupcakes. I had an idea to make and sell decorated cupcakes for the romantic holiday. But who would buy them? Perhaps if I approached people in town? Oh my gosh! I couldn’t possibly! That would be crazy! So I ran the idea past my trusted sister. Being from the same gene pool and sharing the same kind of crazy as me, she thought it was brilliant and urged me to do it! She convinced me that I had nothing to lose and that if I didn’t do it now, I never would… so I did! She was very right and I am so glad that I turned to her at this moment in my life. 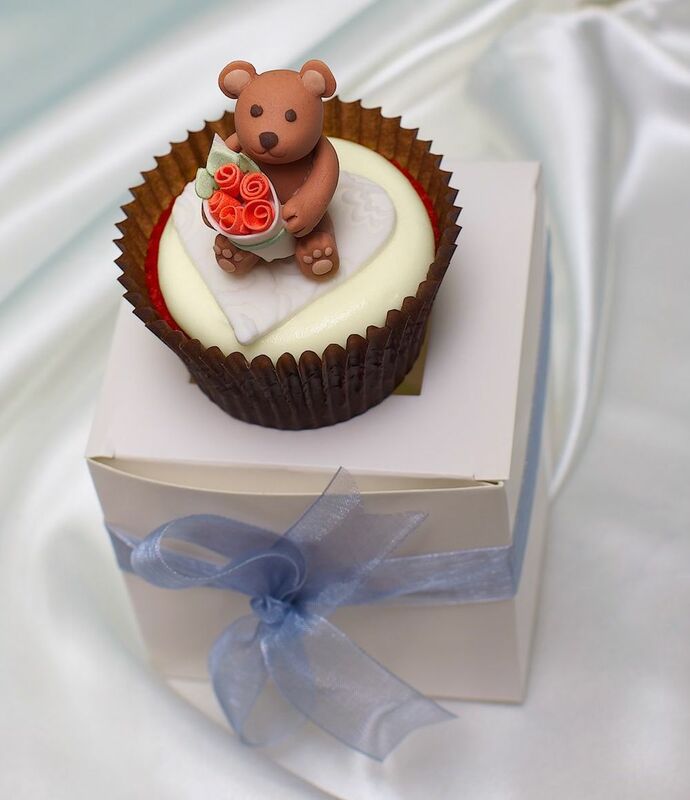 Valentine's Day Cupcake: Teddy Bear with Roses. Valentine’s Day was a big success, although it was incredibly hot that day and the chocolate frosting on the cupcakes melted which nearly caused me to go into premature labour. I had such a lovely responses from customers so I started The Cupcake Run, which was basically selling cupcakes to shopkeepers and businesses in the CBD of Byron Bay. I started my Facebook page and a small customer base emerged. My dream was coming true! The whole process was kind spur of the moment and rushed. I registered my business without much thought to the future. After all, this venture was highly experimental and to be honest, I really didn’t think it would succeed. What did I make? Cupcakes. Who made them? Me… Tara. And that is what I called myself! Cupcakes By Tara. My first loge, designed by my loving husband. My second logo. Designed around the time I was selling cupcakes to businesses in town for morning tea... I had a bob hair cut ;). Now, you would think that anyone who obsesses about something for quite some time would eventually tire of it. Not I. The more I learned, the more I wanted to know. I tackled new projects, recipes and decorating techniques. If something didn’t work, I couldn’t walk away and let it win. I had to keep trying until I conquered. Over time I evolved. I started experimenting with cakes (which initially scared the beejeezus out of me), macarons (yes, I had a few tears), and trying my hand at dessert tables. Pretty soon I was getting referrals from wedding venues. The common response I heard back from couples was, “Does she only make cupcakes, because I want a cake”. I got this feedback so often that one day I decided that I had to change my name. Again I turned to my sister for advice. Her husband ran every new business name I came up with through Urban Dictionary. Well! That was educational! Let’s just say that many a newly thought up business name was thrown on the scrap heap… pronto. Apparently I have lead quite a sheltered life. And then the Byron Bay Cake Boutique popped into my head. It passed all the tests. Urban Dictionary didn’t twist it into something unsavoury or grotesque. We had a winner! So here I am, at the beginning of a new chapter. I still hold true to the ever-faithful cupcake and everything that Cupcakes By Tara ever stood for, but it is time to embrace something more. I have so many of you to thank. I hope that you all like the new changes that I have made to my budding business and I hope that you will all continue along the way with me. I feel so very blessed to be able to do what I love and I couldn’t do it without you all. In particular, my sister. I thank you most of all for believing in me. My sister (on the left) and I (the bride). * Please note my blood shot eye. Being a bride is VERY exhausting and I also cried when I saw my wedding bouquets because they were so beautiful. A tad emotional?